If you’re considering dental implants or decided that dental implants are right for you, you may be wondering how they work. The placement of a dental implant involves several steps, but starts with surgically placing the dental implant into the jawbone. Dental implants are typically cylindrical and/or tapered posts made of titanium. After an opening in the jawbone has been created in preparation for the implant, the implant is then placed. 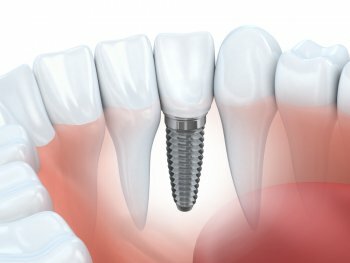 Though the installation of dental implants does require surgery, it’s a predictable and relatively pain free procedure. The length of the appointment depends on a series of factors including the number of implants being placed and accessibility to the surgical site. While any dental surgery may cause discomfort, we do our best to make the procedure as pain free as possible. After the procedure any soreness and swelling in the gums and areas surrounding the location of the implant can be treated with non-narcotic pain medication as needed. We also offer sedation dentistry for those patients who may need extra assistance. After the implant is installed the bone grows onto the titanium surface of the implant to form a strong and long-lasting foundation. Osseointregration is the name of the healing process describing the implant fusing with the jawbone. 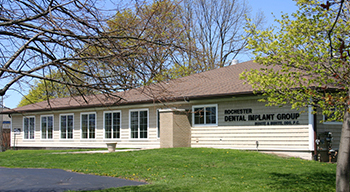 Once the implant has bonded with the jawbone, a small connecter referred to as an abutment is placed on top of the implant to connect the implant to tooth-like crowns, bridges or dentures. This final phase involves a custom restoration for the tooth to be securely fitted and placed. The abutment posts serve as anchors that hold the carefully crafted dental prostheses and provide the patient with natural looking and feeling teeth. What to Expect After Getting Dental Implants? Missing teeth that have been replaced with dental implants look, feel and function just like natural teeth. The success or failure of dental implants and their prostheses (crown, bridge, or denture) is dependent both upon the overall health as well as the oral health of the patient. If you do get dental implants, it is necessary to maintain good oral health including brushing and flossing daily, use of a water pik and other interdental cleaning devices, and regular hygiene visits to your dentist.